Note: K06 in sizes 10cm - 13cm are made with "Litefoot" foam for toe flexibility. We do not recommend this above 13cm as weight savings is negligible and durability is significantly reduced. 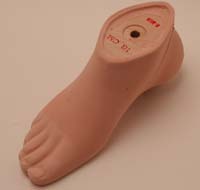 Refer to this guide for instructions on how to properly select a Kingsley foot for your patient. This document also contains fitting and modification instructions for correcting anterior and posterior lean. Use this chart to get an overview of the dimensions available for various Kingsley molded feet. Diagrams of Kingsley molded feet dimensions.